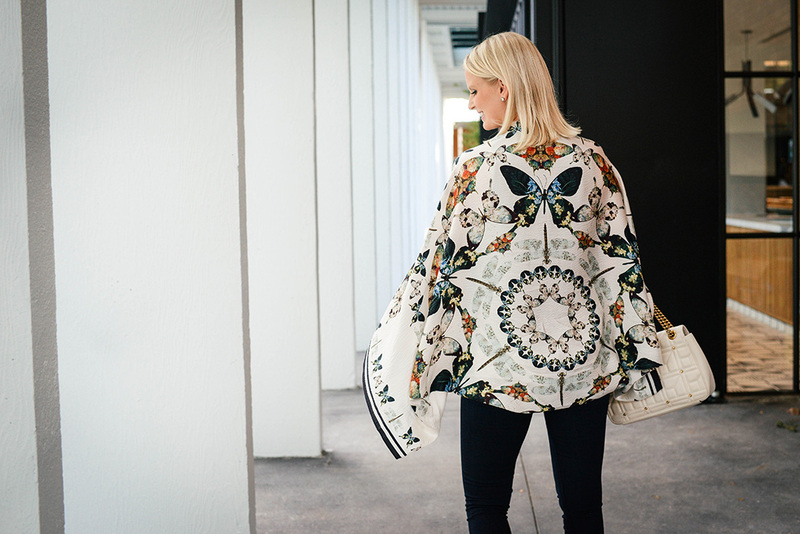 There are two things this pretty cape scarf reminds me of: 1) the song Butterfly by Mason Jennings, and 2) Alexander McQueen. Season after season you can always count on McQueen to come out with an assortment of prints, many with a kaleidoscope nature to them – this little number is a good example of that. The content of the prints change each year, but last fall’s dominating theme was the butterfly. 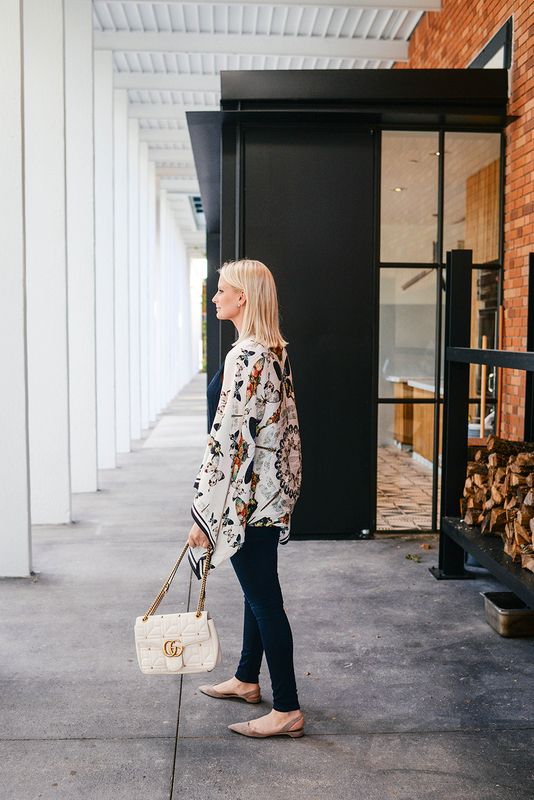 If you’ve followed along for awhile, I generally don’t wear many prints on a day-to-day basis. Only a really fabulous printed piece will catch my attention and make it worth the investment – this is typically reserved for a fun cocktail dress or some other statement piece. That all changed, however, when I saw this Ted Baker cape scarf. The print, colors and high-quality fabric instantly made me think of Alexander McQueen… but at a Ted Baker price point. It’s a win-win! It’s very lightweight which makes it an excellent accessory for transitioning to fall in Texas. It packs flat when it’s folded up, so it’s a great option for travel as well! The abundance of colors in the scarf make it surprisingly versatile too, but I enjoy pairing it with navy. As I was writing this post yesterday, I discovered the scarf had gotten marked down and then sold out! Such a bummer. With that said, Ted Baker has quite a few other great cape scarves available! Don’t miss this one and this one. This long-sleeved tee looks SO soft and like the perfect fall basic to layer with! Plus, it’s under $80. If you love a good bow, don’t miss this sweater. So sweet! This colorblock dress would be such a great piece for the office! Bonus that it features a little fall color! This tunic-style sweater exudes casual elegance, don’t you think? Very Brunello Cucinelli. The belted waist shows off your shape too! Try the velvet trend for fall with this easy tee! I’d buy it in black. I’m not sure if I need more one-piece bathing suits, but if I were to add one it would definitely be this beauty. On the hunt for a classic winter coat? This style is feminine, flattering and comes in amazing colors (neutrals and color alike!). I have it in magenta! 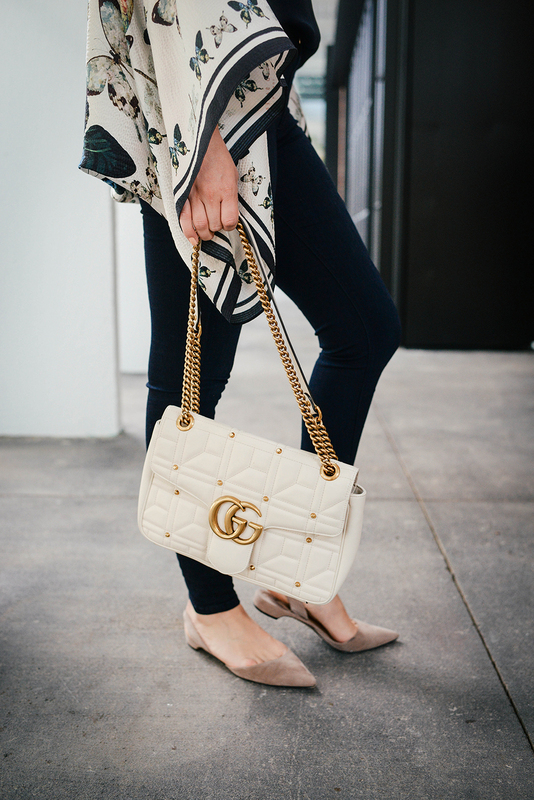 PS – don’t I wish I had this bag… borrowed it from my stylish mama who was in town when we shot this look! It’s making me think I should get one! 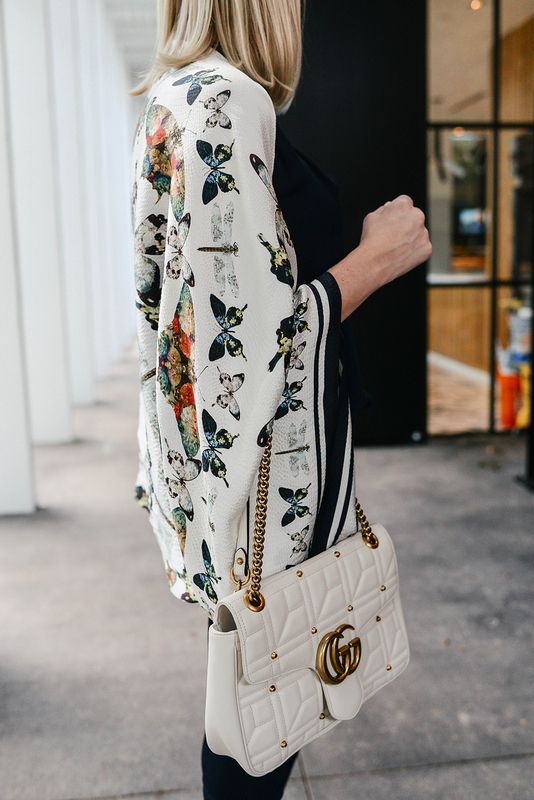 That butterfly kimono is so beautiful! That cape scarf is exquisite! Such a beautiful print! I love how you kept the rest of your look simple and understated. Especially loving those flats! 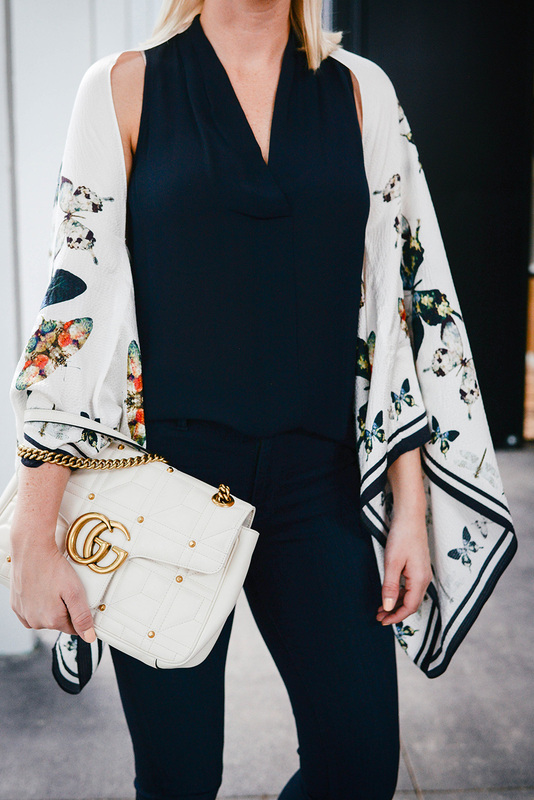 I love the little kimono but those flats are really speaking to me!